Whether or not the late, great innovator would have disapproved (of course he would’ve), this release includes a quartet of documentaries that shed much light on his creative process. 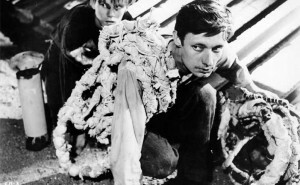 The film they accompany is one of Bresson’s masterpieces, a picture that gets fresher with age. Set in 1943, the film revolves around a French resistance fighter named Fontaine (Leterrier) who plots to escape a German military prison before his death sentence is carried out. (The French title translates as “A Man Condemned to Death Escapes, or: The Wind Bloweth Where It Listeth”). Given Bresson’s famously austere approach, it might seem incongruous to declare that the film is one of the most exciting prison-escape movies ever made, but it most definitely is. Francois Leterrier attemtps to bust out of a Nazi prison in A Man Escaped. The reason the film retains its power is the eternal “mystery” of Bresson’s oeuvre — namely, how such minimalist works can evoke so much emotion. He outlined his methods in interviews and in his book of filmmaking rules/aphorisms Notes on Cinematography. Taken individually, all of his “effects” — oblique camerawork, key actions left offscreen, the training of nonprofessional actors to “erase emotion” — would seem likely to alienate viewers. Instead, Bresson’s best work, including A Man Escaped, draws the viewer in and makes him or her feel what the protagonist feels, physically and emotionally. Every one of Bresson’s thirteen films can be explored to good advantage with supplemental materials. (One can only hope that his long-missing-in-the-U.S. Four Nights of a Dreamer will finally get a release soon.) A Man Escaped is definitely in the top rank. 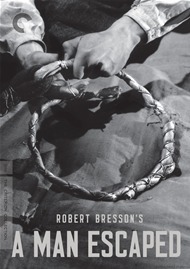 Foreign movie mavens will thus be glad that Criterion includes not one but four documentaries that “unlock” Bresson’s intricate and deft stylization. “The Essence of Forms” is a French video production from 2010 that includes various colleagues of Bresson’s shedding light on his methods. The most interesting revelations concern how little he would instruct the cast and some of the crew. Geneviève Cortier, the script girl for several of his films, describes how he never criticized the cast for not giving him what he wanted (or even told them precisely what that was). He would instead make them repeat the dialogue until they were “worn out” and wound up doing it the way he preferred. The same went for his editors, according to Cortier. He never entered the editing room, but when he was dissatisfied he would simply tell the editor to edit the sequence in question again. That kind of indirect-direction could seemingly lead to disaster, but Bresson’s way of making films was so unique that the editors surely were inclined to understand his very specific wishes. They certainly would’ve known what he wanted if they saw the invaluable 1965 TV documentary from the Cineastes of Our Time series, included here. “Functions of Film Sound,” a featurette made for this package, outlines the importance of sound in A Man Escaped through film clips underscored by text from Bordwell and Thompson’s celebrated textbook Film Art. The piece de resistance, though, is the 1984 Dutch documentary “The Road to Bresson.” Documentarians Leo De Boer and Jurrien Rood offer a perfect Bresson “101” that includes fascinating quotes from the best known of his actors, Dominique Sanda (1900), as well as three devout Bressonians — Louis Malle (Zazie Dans Le Métro), Paul Schrader (Blue Collar) and Andrei Tarkovsky (Solaris). His filmmaker-fans offer some fascinating insights into Bresson’s films — most notably Tarkovsky’s contention that Bresson’s films declare “absolute independence from the viewer… you may accept this film as art or not accept it.” The documentarians scored a major coup by giving the 82-year-old Bresson the last word, as they snagged five minutes with him when he as at Cannes representing his final film, L’Argent.